Ace of Base: to ace SI to SI conversion, look no further than the number 10. Moving the decimal or changing the exponent of your base of 10 is all you need to convert one SI unit to another. To convert, count the number of exponents of difference, then either move the decimal or use dimensional analysis (more on that later). so the decimal would be moved THREE places to the RIGHT. mg to kg (milli to kilo) is difference of 6 decimal places (10-3 to 100 which is 3 places and then again to 103 which is another 3 places). So move the decimal 6 places. Which direction? We are going from a small (m) to a large (k) unit so we move to the left. 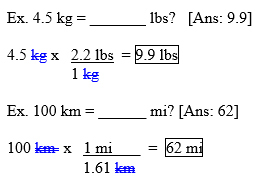 Since there is not a consistent change in the size of units, like in the SI system, you will need to use dimensional analysis, or a ratio method of conversion, to convert between SI and American units. The ratios used are called conversion factors, or equivalencies. Think of conversion factors with which you are already familiar, such as currency values. We use these conversion factors and dimensional analysis to convert from one unit to another. Multiply the given unit (what is given in the problem) by the conversion factor (in fraction form) such that the given units are opposite one another, and when multiplied, cancel each other out! Same method is applied as before but two units are converted. This is used when have derived units. Temperature units are the only units we use which are not converted using these methods. Instead, we used equations. There is no direct method of conversion for Kelvin to Fahrenheit so both equations must be used in succession or combined.